Features - Stylish Touch Buttons Design. FM Transmitter Frequency: 87.7/88.1/88.5/88.9/106.5/107.1/107.5/107.9MHz. Built-in 3.5mm Headset Jack. 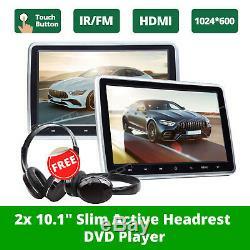 10.1 LCD Screen In-Car & Portable Car Headrest DVD Player HD SD USB IR FM Game. 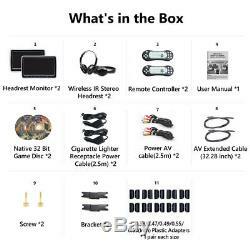 (HDMI adapter cable is not included in the accessories). Adjustable bracket axis maximum distance: 161mm, minimum distance :110mm - The three adjustable distance between DVD player to the bracket : 40mm, 46mm, 52mm - Aspect scale : 4:3PS/4:3LB/16:9. Supports 32 Bit Game - Supports Screen Reversal Function. Sound Mode: Standard /Music Hall / News / Theater. Picture Mode: Standard /Bright / Soft / Best. Color: Standard / Warm /Cool. Languages: English /Japanese/ German / Spanish / French /Portuguese/ Italian /Turkish. Operating Voltage : DC10-15V - Maximum Operating Current : 1A. Product Dimensions: 261(Width) x 169 (Height) x 34 (Thickness) mm. Gross Weight : 3.3kg(A Pair) - Net Weight : 1.6kg(A Pair). 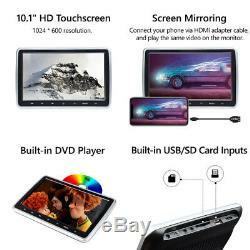 Size : 10.1 Digital Screen - Resolution : 1024x600 - Adjust Screen Brightness / Contrast / Tone/ Saturation. Built-in USB/SD Inputs - USB Input: Supports USB flash drive and MP3 players with up to 32GB of storage. SD Input: Supports SDHC card with 32GB maximum capacity. Video Formats: Supports MP4, AVI, RMVB, FLV, MPG and etc. Audio Formats: Supports MP3, WMA, WAV and etc. RCA Audio R / L Input / Video Input 1. RCA Audio R / L Output /Video Output2. HDMI Input1 - 3.5mm Headphone Jack 1. E0780 W ireless IR S tereo H eadset. Wear comfortable with humanization design. Free to control headset volume. 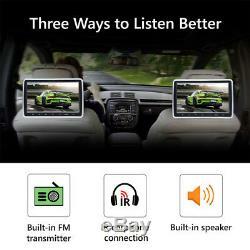 Compatible with most of vehicle audio products. Frequency: Channel A: L/2.3MHz, R/2.8MHz Channel B: L/3.2MHz, R/3.8MHz 3. Frequency Response: 20 hz-20khz 7. Power Supply: Two AAA batteries (Battery is not included in the accessories). Can the item play the same video? 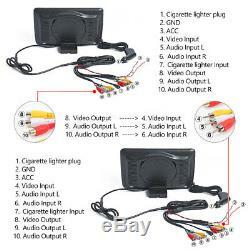 Yes, it can show the same video on the two DVD players, and it can also play two different DVDs separately. Does the item comes with two DVD players? Yes, the C1100A comes with two DVD players. Does this come with the headphone? The item comes with two IR headphones. Does this fit for my car? The Adjustable bracket axis maximum distance is 161mm, minimum distance is 110mm. 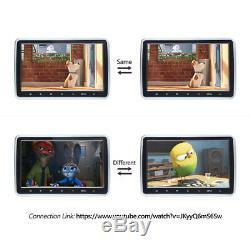 The three adjustable distance between DVD player to the bracket is 40mm, 46mm, 52mm. Please check the size as above. Can I add one more headphone to use? It is ok to add one more IR headphone. If a video game can be connected to it via the HDMI cord? It can input the video game via HDMI. What game disc I can use for this device? It supports 32 Bits Game disc. Eonon C1100A Customer Reviews - YouTube. We will choose the lowest price for your cities. Above is the policy of Courier Company, hope we could get your understanding and attention. Unconditional Return within 60 Days. All our items are brand new. However, we are not responsible for installing or uninstalling. Product is opened or repaired by unauthorized person. Certified technicians test all the items before sending to you. 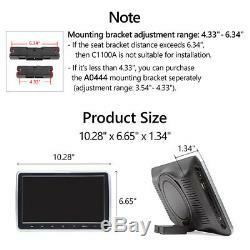 The item "10.1 LCD Screen In-Car & Portable Car Headrest DVD Player HD SD USB IR FM Game" is in sale since Wednesday, September 5, 2018. 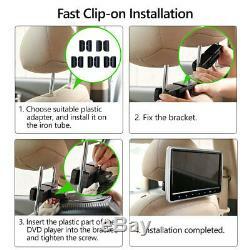 This item is in the category "Consumer Electronics\Vehicle Electronics & GPS\Car Video\Car Monitors w/Built-in Player". The seller is "incarworld" and is located in Perth Amboy, New Jersey. This item can be shipped to United States, Canada, United Kingdom, China, Mexico, Germany, Japan, Brazil, France, Australia, Denmark, Romania, Slovakia, Bulgaria, Czech republic, Finland, Hungary, Latvia, Lithuania, Malta, Estonia, Greece, Portugal, Cyprus, Slovenia, Sweden, South Korea, Indonesia, South africa, Thailand, Belgium, Hong Kong, Ireland, Netherlands, Poland, Spain, Italy, Austria, Bahamas, Israel, New Zealand, Philippines, Singapore, Switzerland, Norway, Saudi arabia, Ukraine, United arab emirates, Qatar, Kuwait, Bahrain, Croatia, Malaysia, Chile, Colombia, Costa rica, Dominican republic, Panama, Trinidad and tobago, Guatemala, El salvador, Honduras, Jamaica, Viet nam.